My friend Lynn is back to share part two (see Part One here) in a series of blog posts to educate us on the proper steps to take in order to be prepared in case of an emergency. Welcome back to Lynn’s take on life: planning, protection, preparation and proactive steps for you to begin now! Today, we’ll learn about how best to protect yourself, your loved ones, your income, your assets and your health with insurance. Note to all – this topic falls on the dry side (pardon the pun) of things to talk about; nonetheless, these are important matters – it is of vital importance to cover your assets! Life is unpredictable. Sometimes in amazing ways and other times in ways that upset everything we do or have. We can take steps to mitigate the undesirable risks for ourselves, our loved ones and our assets. 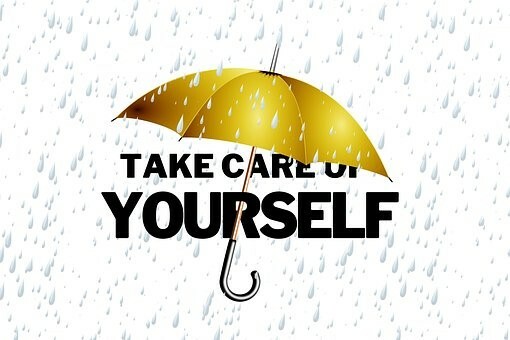 Insurance is a lot like that umbrella – great to have when it rains! When I was younger, my corporate job provided me with health, life, disability and umbrella insurance as employment benefits. I didn’t know what I didn’t know about insurance. My family was not conversant about these types of personal matters and in hindsight, I realize how little I thought about any of this. Now I know better. There are a number of insurance options out there and many factors to consider in evaluating what’s right for each individual. 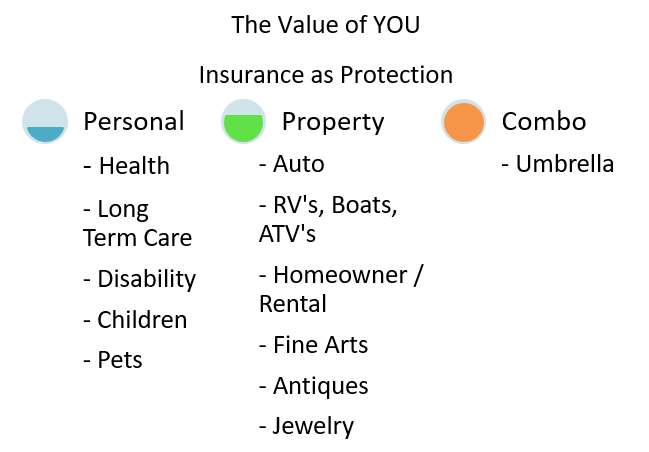 Age, marital status, children, lifestyle, employment benefits, residence, vehicles and other valuable possessions all comprise areas of consideration for insurance policies. Let’s take a look at the various policies on the market today and consider what you need, when you need it, how much you need and the protection provided throughout life’s different stages. (1) Health Insurance – A recent Harvard study noted that statistically, “your family is just one serious illness away from bankruptcy.” Over 50% of all personal bankruptcies in the US were caused by health problems. Staggering, isn’t it? Paying for health care without insurance is virtually impossible to afford. Under current US law, children may stay on parents’ policies until age 26. If you have a job, employer options may be an option, but if not, shop the personal insurance market. At the other end of the age spectrum, Medicare health insurance becomes important, as well as policies to supplement that. To qualify for Medicare benefits (today in 2018), you need to have earned about 40 “credits” or “quarters” by paying Social Security and Medicare payroll taxes while working — equal to about 10 years of work — in order to get Part A services without paying premiums. The premiums have already been covered by your prior payroll taxes. You are eligible for Medicare Part A if: You are age 65 or older and a U.S. citizen or permanent legal resident of at least five years in a row; if you are already receiving retirement benefits; or if you are disabled and receiving disability benefits. Short-term and/or long-term care plan? Health Maintenance Organization (HMO); Exclusive Provider Organizational Plan (EPOP); Preferred Provider Organization (PPO); High-deductible Health Plan (HDHP); Consumer-driven Health Plan (CDHP) or a Point of Service (POS) plan? Deductibles – what are you comfortable paying out of pocket each year? Office co-pays – again, out of pocket expense? Professional services (i.e., x-rays, lab work and surgery) coverage? Cost of hospital stays/ER visits? What is the lifetime payout maximum for the plan? Specialty services (physical therapy, chiropractic, acupuncture, etc.) coverage? (2) Auto Insurance – The National Safety Council reports vehicle deaths caused by auto accidents topped 40,000 in the US in 2017 in over 7,701,000 accidents. If you have a car, insurance to cover your liability to other drivers is required in all 50 states. Minimum requirements vary by state, so check your own state to verify. (3) Disability Insurance – Social Security Administration estimates that more than 25% (3 in 10) of all people in their 20s will be disabled before retirement. This is humbling. Most of us rely on income to live, therefore disability insurance is a must have as a way to replace your lost income to continue your standard of living. Short-term (few months to one year, typically replaces 60% of base salary) or long-term (benefits end when disability ends, typically replaces 40% of base salary) disability coverage? What is the waiting period required before you can collect payment? What is the occupation class (risk factors) of your policy? What is the benefit length? Is there a cost of living rider for the policy? Are there other policy riders? If so, what are they? Can you increase the coverage amounts of the policy? Can you take the policy with you, if you leave the company? Does the ability to claim benefits end at a certain age (i.e., 65)? If you are self-employed, there are a number of providers offering policies. Be sure to check their financial strength rating from insurance ranking organizations to be informed before you buy. (4) Homeowners or Renter’s insurance – Disasters happen! Fires, storms, earthquakes, leaks, hot water heater problems, etc. etc. Think about the costs of replacement. What is the price to rebuild, per square foot? What would it cost to purchase your personal items again today? What is your liability if someone or something from your home impacts another? This is a non-negotiable insurance needed at all times in life. In the case of renter’s insurance, policies typically cover your personal property, contents, liability and a temporary living situation if needed ($30-$50K plan with a $50 – $100 deductible). US average cost is under $200/year, with those in high cost areas paying more. Homeowner’s insurance policies have some interesting twists. It may be that your home is actually a condominium which has coverage from the homeowner’s association. If you have a homeowner’s association, check the policy itself and verify if and what coverage is included (flood, earthquake, other disasters, outside structures, etc.) paid in part through your monthly assessment. For a separate condo policy (typically H06 type), coverage includes interior replacement of your personal property, appliances, equipment, fixtures (anything inside the walls). The deductible amount will dictate your annual premium. For example, my policy includes a rider for some special items I own and I pay $400/year. Free-standing homes are all yours to insure. Policies have lots of “add-on’s” (think flood insurance, earthquake insurance, et al). Realtor.com reports that the average policy in the US costs $952/year. You may save substantially by asking your provider about bundling your homeowner’s policy with other types of policies, age discounts, credit score discounts, safety features, recreational areas (pools, playgrounds) and/or other personal factors. (5) Life Insurance – While there are two main types of life insurance policies (whole and term), there are a number of new hybrid policies on the market today. Both death benefits and living benefits are worth considering for you and your family. I had my life insurance paid for 30+ years in corporate leadership roles. But I hadn’t thought about life insurance as a diverse investment vehicle with accumulating cash value. Now that the policies offer “living benefits” such as this, even as a single person I have invested in policies. This provides me with options for use in case of illness or accident and offers me a way to borrow from myself if needed. Consider a couple of other thoughts while we’re on this topic: your spouse, children and grandchildren. Some use life insurance as a savings and/or an investment vehicle now – the accumulation of cash value, ability to borrow against the policy for school, down payments, et al and tax benefits are worth exploring. (a) Term life insurance covers you for a length of time (thus the name “term”). It expires after a number of years (10, 15, 20, or 30 years) and is typically much less expensive than other types of insurance. Term insurance is great for immediate protection for a family in the event of an untimely death. (b) Whole life insurance is a permanent policy (does not expire) and covers you for as long as you maintain the payment required. The value of this policy may change over the life of the policy and is typically more expensive than other types of insurance. It can be used by some as a retirement planning option to mitigate taxes and borrow against to invest in various assets (loans which must be paid back or which reduce the death benefit). (c) Long-term care (LTC) life insurance as a “linked benefit” or whole life option. Long-term care policies today are facing a dilemma – rising costs of assisted living, long-term care facilities and in-home care providers. The payout from policies is high and the original policies in the market are not covering true costs. Thus, maximum benefits, annual premiums and the policies themselves have changed since entering the marketplace. Stand-alone LTC life insurance policies or LTC-riders to life insurance policies provide a cash benefit and/or reimbursement option if you qualify. Typical requirements to withdraw funds include the inability to perform two of six activities of daily living (ADLs). After a qualifying process and elimination period, you receive income from your policy as is dictated by the policy provisions themselves. Rather than waiting to purchase until we are close in age to needing it (which would be exorbitantly expensive or even impossible to procure), these policies can be purchased in your 40s and 50s, when they are cheaper and it is easier to qualify. This was a must-have policy for me to avoid wiping out all resources due to potential expensive care needs. (d) Universal Life policies generally come in three flavors: i) Guaranteed; ii) Indexed and iii) Variable. (i) Guaranteed Life (GL) is a lower priced permanent policy (term/whole life hybrid), builds minimum cash value and the coverage ends at a predetermined age (90, 95, 100, 110 and 121). A great GL policy for estate planning purposes includes a “second to die” policy, which pays out on the death of the second spouse with typically reduced premiums. (ii) Indexed universal life (IUL) policies may be a good option for some to consider. IUL’s provide cash value accumulation, guaranteed minimum returns on the money you pay in and protection from equity market downturns. (iii) Variable universal life’s face value fluctuates depending on the value of the US dollar, securities or other equity products supporting the policy at the time payment is due. This is a great policy when markets are doing well, yet the increased premiums due in market downturns may be too much for some. (e) Single Premium Permanent Coverage (whole or universal life) is a policy where you purchase the policy in a single lump sum. It does not qualify as cash value life insurance, and thus loses some tax benefits. (f) Guaranteed Issue Life is “no questions asked” life insurance. States restrict these policies that are typically for ages 45-85. These are minimal policies for those looking to pay for final expenses/burial expenses. (g) Accidental Death policies cover death from trips and falls, accidental poisoning, and acts of God. They do not cover suicide. These policies do not cover natural death (heart attack, stroke, cancer, et al), but are possible policies for those who do not qualify for other policies and which offer a double indemnity if death results from a plane, train or commercial boat accident. (h) Simplified issue, “no exam” life insurance is for someone who shies away from needles, or who fears a health condition or family history may surface for them, resulting in denial for a policy. This policy asks health questions, yet does not require an exam. Qualification for (most) life insurance is dictated by the health exam, after which policies and coverage costs are dictated by a team of underwriters. In some cases, a person’s physician is asked to provide a statement, if the carrier wants more information. Get it young and get it healthy, is my motto for life insurance! (6) Umbrella Insurance – what does an umbrella do for us when it is raining? It covers us! This insurance is in addition to your other policies (or in some cases can be a stand-alone policy) to boost your coverage in case of property damage, accidents or injuries of non-household members that occur in home or auto, libel/slander, malicious prosecution, landlord liability and business liability. When you have a higher net worth, it is wise to consider this extra boost in case someone takes you to court, just because. Even if you are in the right, but decide not to fight, the cost of settling litigation is high, whereas the average cost of a $1 million dollar umbrella policy ranges from just $150-$450/year. Check with your homeowner’s or renter’s insurance carrier to see what the additional cost would be to add an umbrella policy to your existing policy, or call around for stand-alone policy prices. (7) Pet insurance (if you have them) Pet insurance isn’t necessarily a must-have, yet for many of us, pets are our children, and we treat them as such. Consider: would you shell out $8,000 for surgery to save your dog’s life? If so, pet insurance might be worth investigating. Some plans even cover routine vet visits and vaccinations, and most will reimburse 80-90% of your vet bills for a premium that ranges from about $100-$300 per year. Whew, who would have thought there are SO many types of insurance? No wonder our heads spin! How do we truly understand the policy options, who sells them and how the policies work when/if needed? You can certainly do the legwork on your own, but there are remarkable licensed professionals providing advice and expertise for each type of policy. How do we find these credible insurance professionals to help us through the process? FINRA (Financial Industry Regulatory Agency) recommends we check with the National Association of Insurance Commissioners (NAIC), which offers a database of financial and disciplinary information for insurance companies nationwide. People elect to buy insurance for various reasons that range from price to peace of mind. The focus of insurance for me is about the financial impact of not having insurance if I experience disruption. What impact would any disruption have on my stability and/or my standard of living? This potentiality affects my peace of mind, which convinced me to explore and purchase policies. What’s important to you? Now it’s time for homework! This short assignment is designed to get you thinking before we cover Estate Planning in next month’s post. Q1: What are my most valuable assets? Q2: What policies do I have today to protect my most valuable assets? Q3: Could I sustain my lifestyle if unable to work? Q4: Which policies would I like to consider moving forward?